As a result of this “great wealth” of complementarity in marriage, the family becomes the first “school where we learn to appreciate our own and others’ gifts.” It is the first “place where we can begin to ‘breathe’ values and ideals, as well as to realize our full capacity for virtue and charity.” In in times of tension, the Holy Father says that the family provides the necessary framework to resolve such issues. Pope Francis also urged the colloquium to extol another truth about marriage: “Permanent commitment to solidarity, fidelity, and fruitful love responds to the deepest longings of the human heart.” On this, Francis insisted that young people, who are the future, must be kept in mind. “It is important that they do not give themselves over to the poisonous mentality of the temporary, but rather be revolutionaries with the courage to seek true and lasting love, going against the common pattern,” he said. Finally, he stated that the family cannot be reduced to an ideological concept, when in fact it is an “anthropological fact.” We should not speak of “conservative” or “progressive” notions of family because the reality of family transcends passing ideological labels. 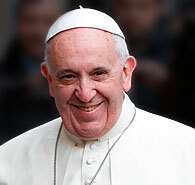 In closing, Pope Francis confirmed that he will be attending the World Meeting of Families in Philadelphia in September of 2015.